So you’ve finally finished your track and you’re ready to share your masterpiece with the world. However, the process of bouncing your music down to an audio file is not quite as straightforward as it may seem. Most DAWs will present you with a myriad of different options when it comes to exporting the track – just take a look at GarageBand’s export options: WAV, AIFF, Apple Lossless or AAC (complete with a selection of four different bit rates ranging from 64kbps to 256kbps). While this in itself may seem overwhelming, plenty of DAWs have even more options than this so it’s essential solid understanding of audio file formats so you’re exporting your track in the right format when the time comes. We can split audio files (or codecs) into two different categories – compressed and uncompressed – with there being some key differences between the two making them suited for different purposes. Uncompressed file formats are essentially the entire raw audio file with no compression applied (not to be confused with the audio processing effect!). This means that you’re getting all of the audio as it should sound making it the highest quality you can achieve with digital audio. Examples of uncompressed audio files include WAV and AIFF (essentially Apple’s version of WAV). 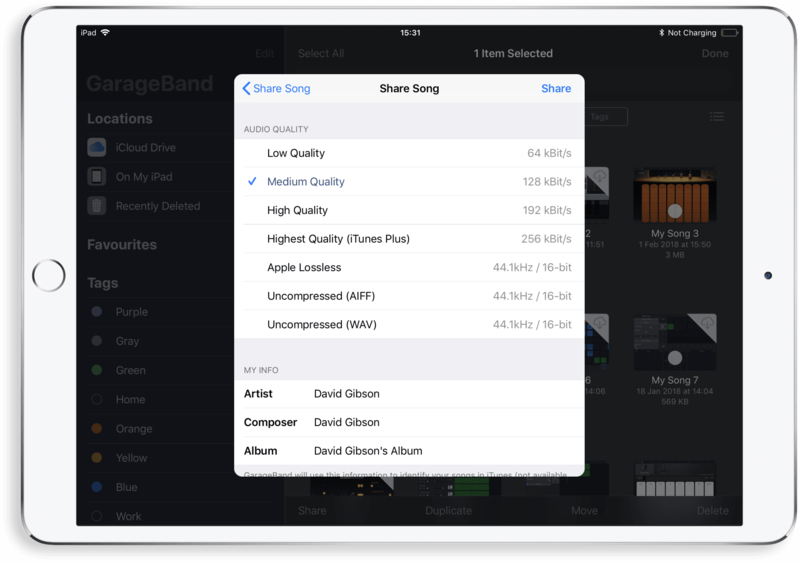 But while having your audio in its highest quality form is no doubt a good thing, there’s one major downside to uncompressed file formats – they’re large, and sometimes that’s just not practical. This is where compressed file formats come in. The big advantage that compressed audio files have over their uncompressed counterpart is the file size. The way in which this is done depends on whether the compressed audio file is a lossy or lossless format (which essentially do what they say on the tin). With lossy formats information is removed from the file to reduce the file size, ultimately reducing the audio quality of the file. But while this may sound like a big price to pay for a smaller file size, the difference between an uncompressed file and a high bitrate AAC is going to go unnoticed by all but the most picky of audiophiles. In fact there’s a lot of debate around whether there is a perceivable difference between high bitrate MP3s and WAV files (try this test to see if you can tell the difference). Examples of lossy formats include MP3 and AAC (which is just like a higher quality MP3). In contrast, lossless audio file formats are larger than lossy file formats but retain the high audio quality of the uncompressed audio. The most well known of these is FLAC – a favourite amongst audiophiles – which gained attention as the format being used for Neil Young’s ill fated Pono player. But as I mentioned earlier, most of the time you’re unlikely to actually be able to tell the difference between lossy and lossless files. However, not all compressed files are created equal with the audio quality varying depending on the bit rate of the file. Higher bit rates mean better audio quality but come at the price of large file sizes while the opposite applies for lower bit rates. For example, uncompressed CD audio has a bit rate of 1411kbps while the highest bit rate for an MP3 is 320kbps (at which point the quality is essentially indistinguishable from uncompressed audio). However, with MP3s, once you start going below 128kpbs then your audio is going to suffer a noticeable degradation in sound quality. So unless a small file size is your main priority, you’re best sticking to the highest bit rate you can. But what does this mean in a practical sense? So knowing the difference between different audio formats is all well and good, but being able to know when to use the different file types is the important bit. For example, uncompressed formats are going to be the best choice when you’re wanting to use audio in a project in your DAW (think drums samples or loops). Another prime example of using uncompressed file formats is when you’ve just finished mixing your track and you want to bounce it out to be mastered – using a WAV or AIFF file will ensure that you don’t lose anything between your mix being finalised and the start of the mastering process. However, with uncompressed files being so large in size it makes them impractical for other purposes. For example, MP3s are much better suited to carrying around on your phone and compressed files are superior for streaming services with Apple Music using AAC and Spotify using Ogg Vorbis files. With this knowledge at your disposal, bouncing down your tracks should be pretty easy, just think about what you’re wanting to use the file for. If you’re going to further process the audio (mastering for example) then you’ll want to retain the audio quality and so an uncompressed format would be best. However if you’re wanting to distribute your track to bloggers or fans then a high bit rate MP3 is your best bet.